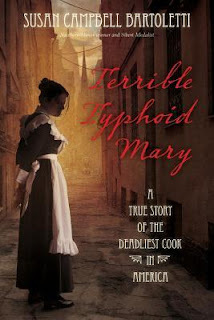 This finely crafted work of nonfiction is a page-turner and paints a vivid picture of Mary Mallon's life and the typhoid epidemic in the early 1900s. Bartoletti uses examples from today to put the events in perspective (example: 6% of Americans today say that they do not trust scientists or scientific information AT ALL, so it's easy to see why Mary did not believe those accusing her of hurting people, especially when she wasn't sick!). Fiance is home from work and working on his stack of Swamp Thing graphic novels!